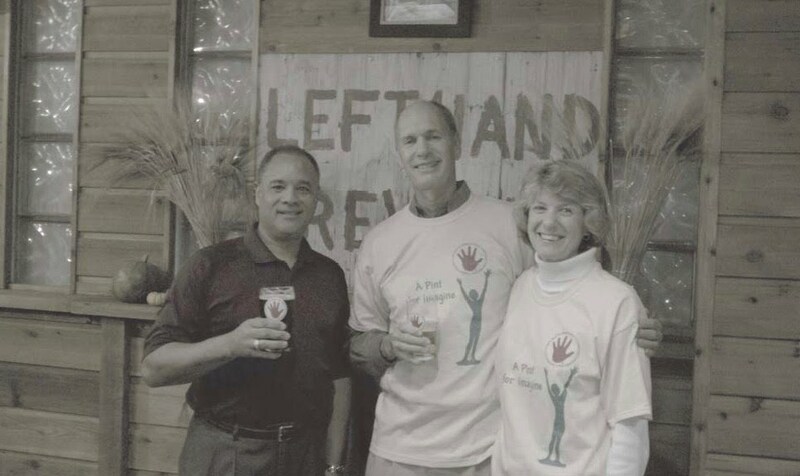 This past Wednesday, Left Hand Brewing Company and Instant Imprints hosted a fundraiser for Imagine! at Left Hand Brewing Company in Longmont. Left Hand donated $1.00 per pint of beer sold, and Instant Imprints donated special Left Hand/Imagine! t-shirts, which were sold during the evening, with proceeds going to Imagine! as well. In all, more than $500 was raised for Imagine!’s programs and services! Thanks to Eric Wallace, an Imagine! Foundation board member and president of Left Hand Brewing Company, and Forrest Fleming, an Imagine! Foundation board member and owner of Instant Imprints, for organizing the event. Extra special thanks to all who showed up to support people with developmental disabilities. Seeing things like this always make me feel proud to be a part of this community. Not only as a representative of Imagine! but also as a member of the Boulder/Longmont/Broomfield community that provides so much local support for our population. Just recently the Twisted Pine Brewery hosted a fundraiser to help one of our Innovations residents take a much needed vacation. It's easy sometimes to become disheartened by the myriad challenges that present themselves in these economic times, so it's nice sometimes to have a reminder that there is still so much support out there! I agree - it's this kind of fuel that keeps our engines running when we feel like we are nearly out of gas.